Through her words, she encourages me to continue on the often difficult path of artistry via an academic approach, with chapters like ‘Presence,’ ‘Discipline,’ ‘The Man,’ and ‘Procrastination.’ Today I am fascinated by the chapter ‘Failure,’ as it seems in trying to be both artist and librarian, I am having a tough time finding employment in the library field. Smith says, “First of all, there is no failure if you’re trying hard. Truly. Second, if there is failure, we can learn from it. Sometimes we try very hard and we fail, at least by our own standards. 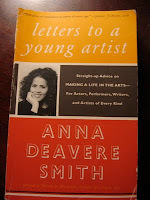 We may have made mistakes, and the ‘failure’ shows these mistakes in the light of day; our failures illuminate new ways of doing things.” Thanks to Smith’s words, I now see that I have not failed but instead found hundreds of new ways of doing things - I only wish they would help me pay my rent! In Let Me Down Easy, Smith’s new one-woman show that I had the opportunity to see last night at The Broad Stage in Santa Monica, CA, she “explores the state of medical care and the availability and efficacy of medical insurance in modern-day America.” To create the show, Smith interviewed 320 people over three continents, 20 of which she performs in the show. Smith becomes celebrities like Lance Armstrong, Eve Ensler, and Lauren Hutton, in addition to the former governor of Texas, Ann Richards, and Heavyweight Champion Boxer Michael Bentt. Smith is brilliant as she morphs from one character to the next, with only the slight nod of her head and the removal of a jacket or ring. 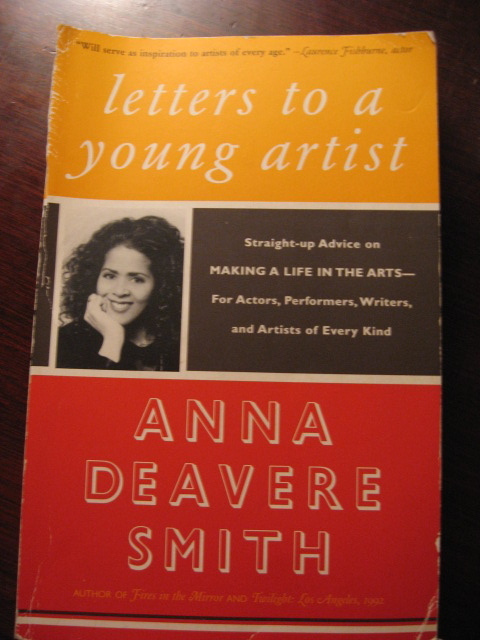 Let Me Down Easy is yet another shining example of why Anna Deavere Smith is not only an artist and academic to watch and read, but a resilient and inspiring woman we can all learn from and admire. Let Me Down Easy runs at The Broad Stage in Santa Monica thru July 31st, followed by an encore presentation at Berkeley Rep August 10 – September 4th. 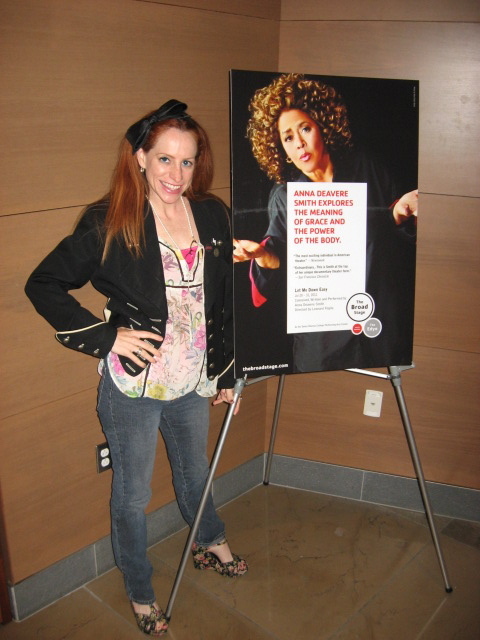 ***A special thanks to David Kessler at The Broad Stage! 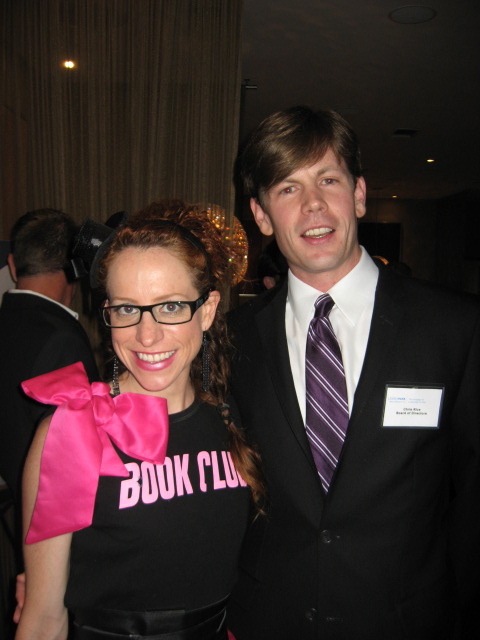 Stand-up Librarian Meredith Myers interviews Author Christopher Rice about the West Hollywood LibraryPark at a fundraising event for the new library. They discuss his role on the Board of Directors, the importance of libraries, the extensive LGBT collection (lesbian, gay, bisexual, transgendered), and his latest book. LibraryPark Campaign Manager LouAnne Greenwald explains how easy it is to make a donation to this state-of-the-art library. For the past several months, I have been working as a volunteer with the West Hollywood Library Fund to help raise money for the new LibraryPark opening in the fall. “More than just a place to check out books, LibraryPark will be completed in the fall of 2011 with an expanded and improved West Hollywood Park and a state-of-the-art library, as well as flexible cultural and civic space for educational and cultural presentations, public meetings, special collections, exhibits and programs,” states the website. Well, I just want to state that THIS is the future of libraries, people, so let’s all get on board to show our support. At a recent fundraising event, held at the Sunset Marquis, where I was once again begging for money for a library even though I didn’t have money for my rent, I had the absolute pleasure of meeting Author Christopher Rice, who is not only on the Board of Directors for the LibraryPark, but the son of my all-time favorite author, Anne Rice. Not to be overshadowed by his mother, Christopher is an exceptional writer in his own right that I have enjoyed since 2000 with the release of his debut novel A Density of Souls, where one of his main characters ironically happened to be named Meredith. Over the past ten years, Christopher has had one bestselling book after another, and with his latest book, (which he kept mostly quiet about when I pressed him), will no doubt be another. While I have nothing but admiration for Christopher as a writer, it was his passion for libraries and his quick wit that impressed me most in meeting him. So when he releases that book, BUY IT! But let’s get back to the library and how you can donate! Donations can be made in any amount but for only $150, you can get your name on a bookcase! How cool is that? Why not buy a bookcase for the friend who has everything? Heck, buy a study room, a whole floor, why not the theater (I’ll come perform for free! If I was already working there that would be a given – hint hint HR dept – another perk in hiring ME!) Seriously, this is a great opportunity to support the community of West Hollywood and literacy, so please donate what you can. 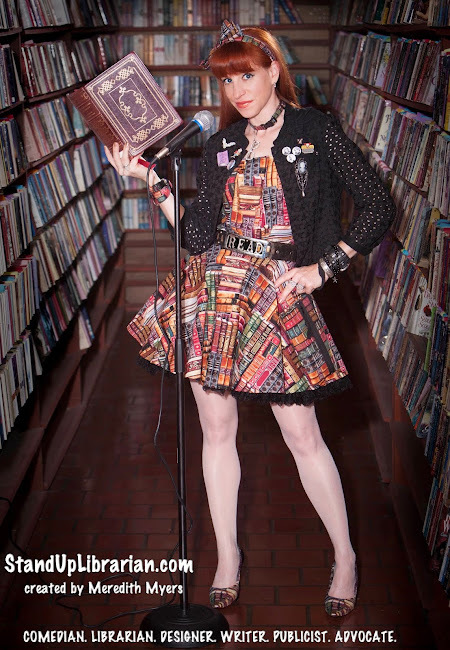 In the first episode of “Storytime with Stand-Up Librarian Meredith Myers,” Meredith reads an important story about employment to the children at the Meredith Myers Library. The book featured in the video is called Overcoming Barriers to Employment: 127 Great Tips for Putting Red Flags Behind You by Ron and Caryl Krannich, and can be found in the stacks listed under the call number 658.339 K89-23. ***Although inspired in part by true incidents, the following video is fictional and does not depict any actual person or event, even though the actress looks a lot like Meredith Myers. In reality, Meredith Myers is the ultimate professional and takes her job as a librarian very seriously, so any future employers should not let this video effect their decision to hire her. The only thing she is guilty of is having a sense of humor during tough economic times. To all the PETA people: ABSOLUTELY NO STUFFED ANIMALS WERE HARMED IN THE READING OF THIS STORY! And yes, parts of this disclaimer was pulled from the "Law & Order" TV show.